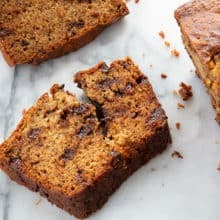 This chocolate chip banana bread recipe is loaded up with two types of chocolate, is moist, decadent and the perfect way to use up your bananas! Preheat your oven to 325 ° F .
Grease a 9x5-inch loaf pan and set aside. Glass or ceramic loaf pans work the best! Beat the butter and sugar together until light and fluffy. Add the eggs into the butter Mix the bananas in. Stir in the dry ingredients mixture until blended. Fold in the chocolate chips and the chopped gourmet chocolate until just combined. Pour the banana bread batter into the prepared loaf pan. Bake in the oven until a toothpick inserted into the center comes out clean,, around 65-70 minutes. Remove the bread from the pan and cool on a wire baking rack completely before storing. Store in a close container at room temperature for 2-3 days.